BRIDGEWATER, Mass. - In its trip up MA-24 North for a non-league tilt with Bridgewater-Raynham, Foxboro certainly made the most of its opportunity, posting a 65-36 win over the Trojans Monday evening. 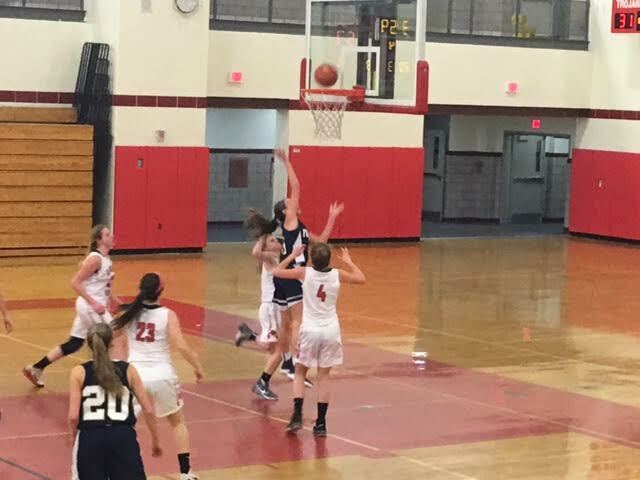 The lethal backcourt trio of juniors Ashley Sampson and Lily Sykes, along with senior Riley Collins, combined to pump in 41 points - outscoring the Trojans on their own - to guide Foxboro (4-1) to its fourth straight victory. The Warriors, coming off a 73-34 slashing of league foe Sharon Friday, picked up right where they left off. Two buckets by Grace Tamulionis (eight points, four rebounds) to open this one pushed Foxboro, which never trailed, ahead 4-0 and set the tone early. Sykes’ (15 points) reverse layup with 1:50 go to in the opening frame, extended the Warriors advantage to 9-1. Not only did the slashing guard play of Foxboro give B-R (3-6) fits on the defensive end, it created havoc for the Trojans offense, which didn’t connected on a field goal until less than 30 seconds remaining in the first when Kelly Page knocked down a 3-pointer. After committing nine turnovers through the first eight minutes, in which they trailed 11-4, the Trojans settled down a bit on offense by scoring 10 points in the second quarter. Unfortunately for B-R, Foxboro was just getting its offense going. Sampson (16 points), who was in foul trouble early, netted 10 points in the second quarter as the Trojans full court press proved no match for her or Sykes. B-R connected on its second field goal of the night to make it a 22-7 game, but on the ensuing Foxboro possession, Sampson was fouled shooting a trey and the captain connected on all her attempts. The Trojans opened the third quarter strong - forcing the Warriors into a pair of rare turnovers - but just could not get enough going offensively to hang around and trailed 50-25 going into the final eight minutes. “We just got a little bit lax with our rebounding and our help side defense wasn’t as effective as it had been in the first half,” Downs said. With 19.1 ticks left, Kristen Bortolotti’s field goal extended Foxboro’s cushion to 29, 65-36. Page paced the B-R attack with a team-high 11 points to complement seven rebounds, five of which were offensive, and Danielle Wabrek snatched eight boards, five of which were offensive. For Foxboro, five players - Sampson (16), Sykes (15), Collins (10), Tamulionis (8) and Lauren Flahive (8) - registered over eight-plus points to headline the balanced Warriors attack. B-R hops back into its Old Colony schedule versus Barnstable Friday at 6:30 p.m.
Foxboro squares off against Stoughton Tuesday at 6:30 p.m. as it resumes league play.